It seems that Blade Runner 2049 couldn't continue the fall hot streak at the box office. Last month, it seemed that the slumping summer months were cured by IT's record breaking opening weekend, and while that has gone on to become the highest-grossing horror movie of all time, and one of this year's highest-grossing movies, it seemed to be just a temporary solution to the industry's box office woes. Last weekend, the highly-anticipated Blade Runner 2049 underperformed and opened with just $32.7 million, just one fifth of its $150 million budget, signalling that studios may be in for a tough month until Marvel's Thor: Ragnarok hits theaters in November. Four new movies hit theaters this weekend, and while we're projecting that Blade Runner 2049 will come out on top with a repeat win, the race will likely be a lot closer than it should have been. Blade Runner 2049 goes up against four new movies this weekend, Universal's low-budget horror-thriller Happy Death Day, STX Entertainment's The Foreigner, Open Road Films' biopic Marshall and Annapurna Pictures' biopic Professor Marston and the Wonder Women. As of now, both The Foreigner and Professor Marston and the Wonder Women reviews have been strong, with The Foreigner posting an 80% score on Rotten Tomatoes and Professor Marston and the Wonder Women posting an 85% score, but there are not enough reviews in for Happy Death Day and Marshall quite yet. 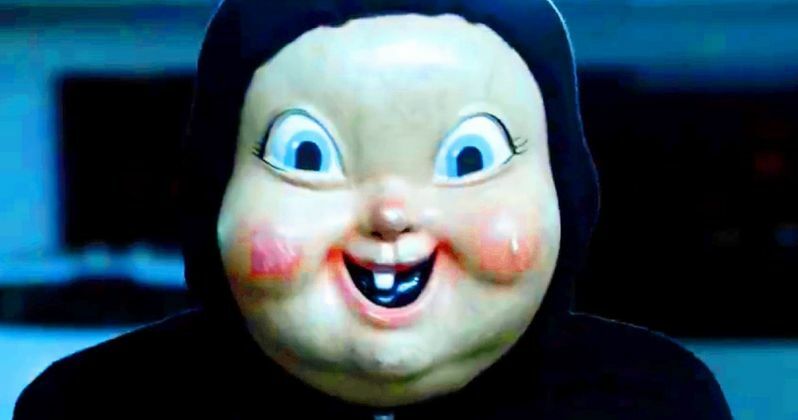 Happy Death Day is estimated to open in roughly 3,000 theaters, with The Foreigner arriving in 2,300 theaters, Marshall debuting in just 800 theaters and no theater count estimate given for Professor Marston and the Wonder Women yet. With all of that being said, we're predicting that Blade Runner 2049 will repeat atop the box office with just $18.6 million. Given the strong critical performance from Blade Runner 2049, it's possible that Blade Runner 2049 may have more endurance at the box office, but we're projecting that Happy Death Day will come in a close second place with $17.4 million, with The Foreigner debuting in third place with $12.6 million and the top 5 rounded out by Professor Marston & the Wonder Women ($6.2 million) and Marshall ($5.2 million). The top 10 will be rounded out by The Mountain Between Us ($4.9 million), IT ($4.7 million), My Little Pony: The Movie ($4.1 million), Kingsman: The Golden Circle ($3.9 million) and American Made ($3.7 million). Happy Death Day centers on Tree Gelbman (Jessica Rothe), a blissfully self-centered collegian who wakes up on her birthday in the bed of a student named Carter. As the morning goes on, Tree gets the eerie feeling that she's experienced the events of this day before. When a masked killer suddenly takes her life in a brutal attack, she once again magically wakes up in Carter's dorm room unharmed. Now, the frightened young woman must relive the same day over and over until she figures out who murdered her. This millennial slasher movie has been called the Groundhog Day of horror movies, although it will remain to be seen if it will catch on with audiences. Also opening in limited release this weekend is IFC's 78/52: Hitchcock's Shower Scene, Bleecker Street's Breathe, Matson Films' The Departure, Fox Serchlight's Goodbye Christopher Robin, Indican's The Lucky Man, Parade Deck Films' Man From Earth: Holocene, Vertical Entertainment's The Secret Scripture, Freestyle Releasing's Swing Away and Super LTD's WASTED! The Story of Food Waste. There is no indication whether or not any of these films will expand to a nationwide release later this month, but that may not be the greatest idea this month. Over the next three frames, including this weekend, there will be a whopping 13 new movies released in theaters, none of which look to break out as a massive box office hit. After the four movies that arrive in theaters this weekend, there will be five more movies opening in theaters on October 20, Warner Bros.' Geostorm, Sony Pictures' Only the Brave, Universal's The Snowman, Lionsgate's Boo 2! A Madea Halloween and PureFlix's Same Kind of Different as Me. Then the weekend after, on October 27, there are four more new movies, Lionsgate's return to the Saw franchise with Jigsaw, Universal's Thank You For Your Service, Paramount's Suburbicon and Open Road Films' All I See Is You. Take a look at our box office projections for the weekend of October 13, and check back Sunday for the top 10 estimates from Box Office Mojo.